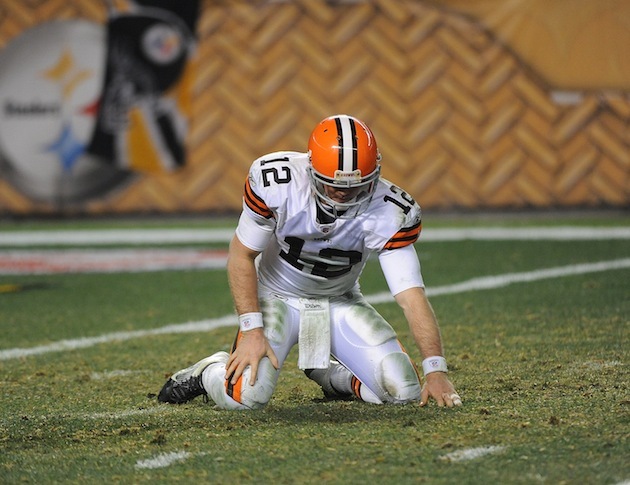 A look back at all of the Browns’ starting quarterbacks since 1999. The Browns signed Robert Griffin III on Thursday, and the former Redskins quarterback is in line to become Cleveland's 25th starting quarterback since 1999. Let’s soak that in for a moment. 25. Twenty-five. 25. We’ve seen more Browns quarterbacks (24) since the team returned to Cleveland than there are batteries in a 23-pack of batteries (23). 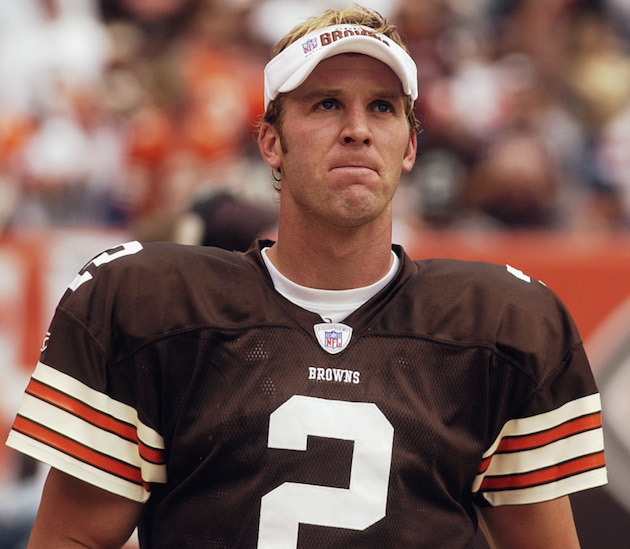 LeBron graduated high school, debuted with the Cavaliers, left Cleveland, won two rings and returned to Cleveland since the last time a Browns quarterback started all 16 games in a season (Tim Couch, 2001). How futile has Cleveland been at sports’s most important position? Here’s a look back at every starting quarterback for the new incarnation of the franchise through last season. Couch has made by far the most starts since the Browns returned to Cleveland, 25 more than the next person on this list. Cleveland selected Couch No. 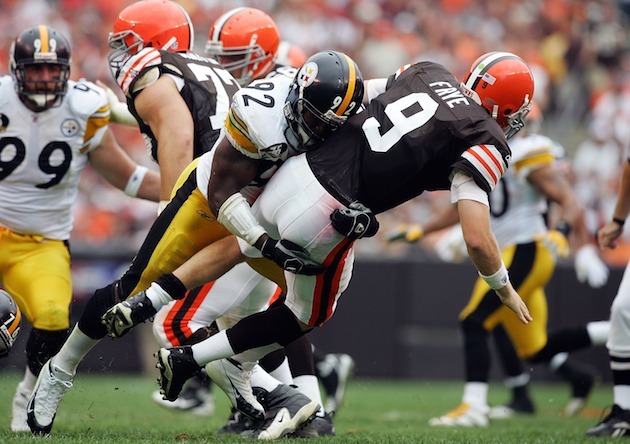 1 in 1999 out of Kentucky, and he had occasional success, including starting 14 games during a nine-win season in 2002, the last year the Browns made the playoffs. 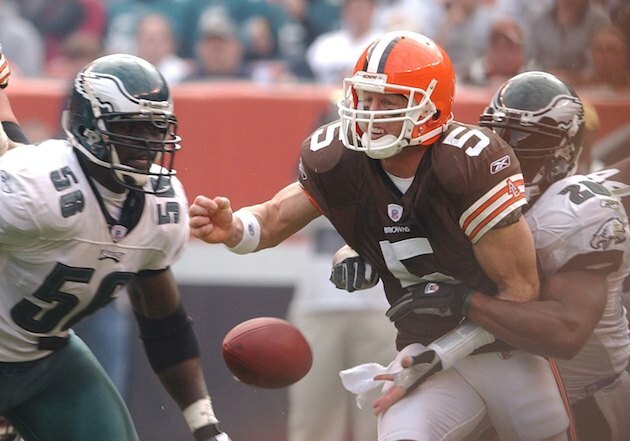 Holcomb actually started in the Browns’ last playoff game in January 2003 against the Steelers, throwing for 429 yards and three touchdowns in a loss. But he was eventually benched for Jeff Garcia. 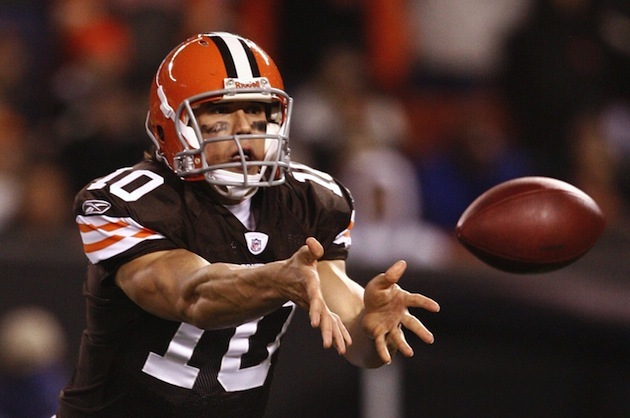 Garcia had the second-worst passer rating of his career during his lone season in Cleveland. He threw 10 touchdowns and nine interceptions after coming over from the 49ers. He left for the Lions after one year, and later found success with the Eagles and Buccaneers. Frye looked promising in the final five games of his rookie season, when he went 2–3 and seemingly formed a solid connection with receiver Braylon Edwards. But he struggled in 2006, and was benched for Derek Anderson shortly into the 2007 season. Dilfer was pretty average and nondescript during his time in Cleveland. Shocking, I know. Anderson was relatively successful in Cleveland. In 2007, he led the team to the cusp of the playoffs with a 10-win season. He even made the Pro Bowl that year after Tom Brady dropped out, and Edwards emerged as one of the league's best receivers—at least for one season. But Anderson failed to recapture the magic his next two seasons, losing his job to injuries and a whole lot of ineffectiveness. 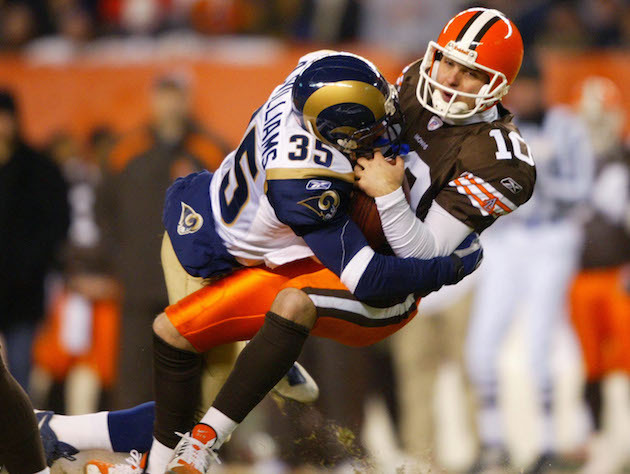 The Browns seemingly struck gold when they drafted Quinn in 2007. They did not. Brady Quinn’s career passer rating? 64.4. McCoy was a highly decorated college quarterback when the Browns selected him in the third round of the 2010 draft. He, like many before him in Cleveland, was stuck in a land of a mid-70s passer ratings before he eventually left the team. McCoy is now the backup in Washington, where he was ahead of RG3 on the depth chart in 2015. Weeden was already old (28) when Cleveland drafted him in the first round. His most memorable on-field moment was getting stuck under a flag. 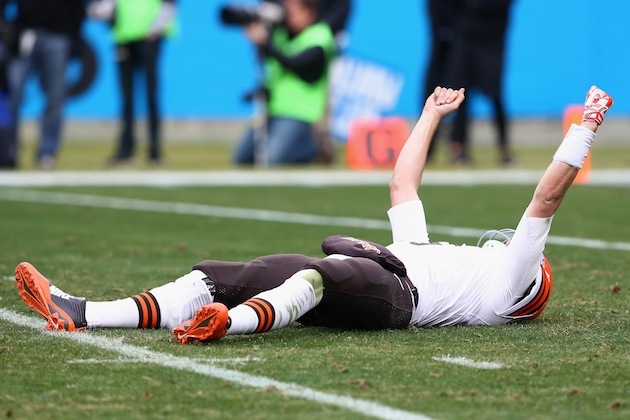 Hoyer started 13 games in 2014, when Cleveland finished with a respectable 7–9 record. At one point the Browns appeared destined for the playoffs, but they faded at the end of the season. Hoyer didn't return to the team. 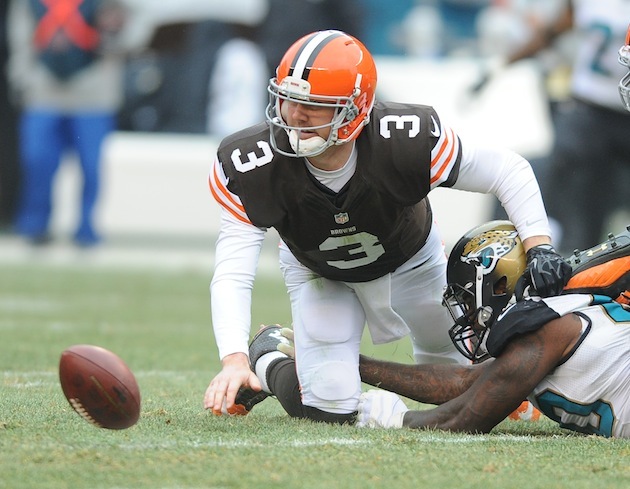 On the field, Manziel struggled,completing only 57% of his passes for 1,675 yards. 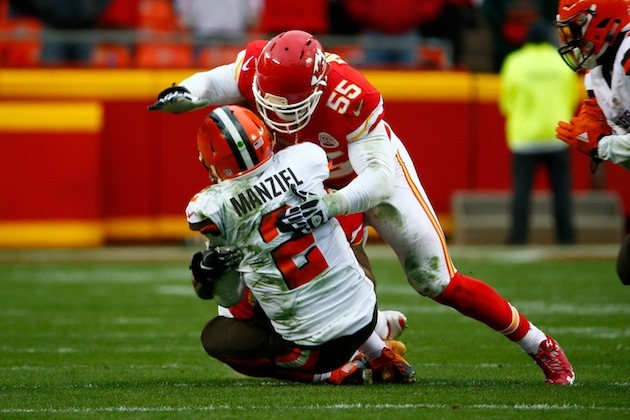 Manziel also recorded seven touchdowns, seven interceptions and seven fumbles. Off the field, well, Manziel had even more issues. The former Heisman winner briefly checked into rehab and continued to party. He was also accused of assault by his ex-girlfriend, a case which is still being considered by a grand jury. The Browns released Manziel in March. And there you have it, all the Browns’ starting quarterbacks since 1999. Can RG3 break the trend of futility? History says Griffin will probably aggressively average more than anything else. And that’s if he’s one of the good ones.